There is an ongoing debate if seedless watermelon are Genetically Modified Organisms (GMOs). Since the devil lies in the detail, it is necessary to understand what GMOs are and how this variety is produced to settle this issue. Perceptions as much as facts drive opinions. The World Health Organization (WHO) regards GMOs as organisms formed by specific techniques that do not occur naturally. WHO clarifies that "The technology is often called 'modern biotechnology' or 'gene technology', sometimes also 'recombinant DNA technology' or 'genetic engineering'. It allows selected individual genes to be transferred from one organism into another, also between nonrelated species." The USDA (page 1) and FDA agree with this definition when they classify crops as GMO food. In this process, a piece of DNA from another species is cut out and then introduced into a crop plant's DNA, to give a recombinant DNA. In natural conditions this kind of combination would not be possible. This technique has been used most often to make crops resistance to some weeds or pests. Seedless watermelon are produced without addition of foreign DNA. It is the plant's own DNA that is duplicated, albeit with the use of chemicals. The next step is normal cross-pollination to get a sterile seedless watermelon. It is only plants, animals, or micro-organisms that have artificial recombinant DNA that can be called GMO, and so seedless watermelon cannot be considered a GMO. The Watermelon Board has declared that seedless varieties are not GMOs, but hybrids propogated through cross-breeding. This view is shared by many like the Washington Post news report and gardening experts. Additionally, Penn State's SC200 course for fall 2104 explains that seedless watermelons are hybrids and not chemical mutants, so they are safe for eating. Watermelon of any kind is not on the list of GMO crops grown in U.S. The GMO crops available in the country listed by Time in 2015 do not include watermelons, seedless or otherwise. They are also not listed in the 2014 summary report from the International Service for the Acquisition of Agri-Biotech Applications of commercial biotech/GM crops. Seedless watermelon get certified as organic fruits according to Genetic Literacy Project (a practice they object to). As a New Hope report in 2012 states, USDA does not give an organic label to produce it considers GMO. So the conclusion would be, if seedless watermelons are certified as organic by USDA, then they cannot be GMOs. A 2010 Washington Post news report estimates that seedless watermelons have been around for more than 50 years. Colchicine is a chemical is used to produce watermelon that are seedless. Colchicine doubles the 22 chromosomes found in normal watermelon to give a tetraploid plant with 44 chromosomes. 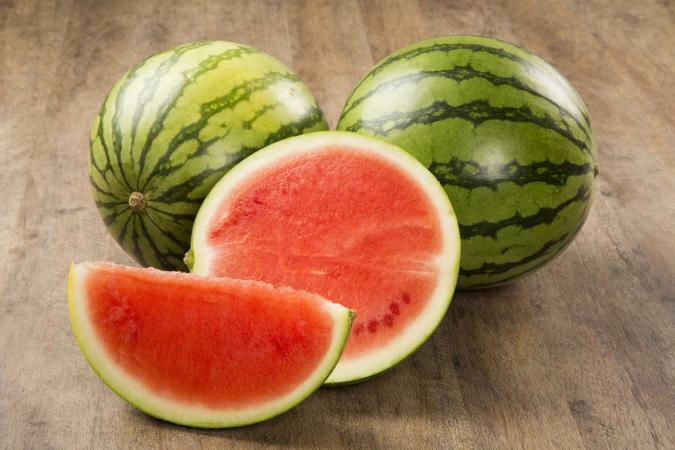 The tetraploid plant is then crossed by pollination with a normal watermelon plant to yield a sterile hybrid with 33 chromosomes, according to Texas Agricultural Extension Service. It is the use of the chemical to tinker with the genes that makes several people including Genetic Literacy Project consider it a chemical mutant fruit. Consumer awareness of what qualifies as GMO often leads them to think seedless watermelon are genetically modified. In 2016, the University of Florida released a report on people's awareness about GMOs by conducting a survey of 1000 people. They found that 80% of those surveyed think any food with DNA in them is GMO and should be labelled. While the fact is, nearly every cell in all plants and animals have chromosomes made up of DNA that determine the features of an organism and how it functions. The name 'Genetically Modified Organisms' is imprecise and leads to misconceptions of what a GMO is. The University of Florida report notes, that consumers think any kind of genetic modification results in GMOs. However, all modern as well as traditional techniques of crop propogation practised over centuries have modified plants genetically. Selection of best performing plants; and forming hybrids through crossing to increase yield, are some examples. All of these methods however involve only natural processes. The 2010 Washington Post found seedless varieties were common in supermarkets and seeded heirloom varieties more prevalent in local farmer markets. Regardless of the controversy, demand for seedless watermelon is on the rise. Agricultural Marketing Resource reports 3.2 billion pounds of watermelon were grown in 2014, and 85% of this was seedless, up from 51% in 2003.